Uganda is gifted by Lake Victoria which is the largest fresh water lake in the whole of Africa. Lake Victoria sunset cruises not much developed provide an opportunity to have some good time on the lake while exploring islands and features with in these fresh water lake. Lake Victoria Sunset cruises normally start at 4 or 5 pm and late evening. There many service providers that organize sun set cruises on Lake victoria and if you have an evening before your go for your safari, Lake Victoria sunset cruises are worth participating in. 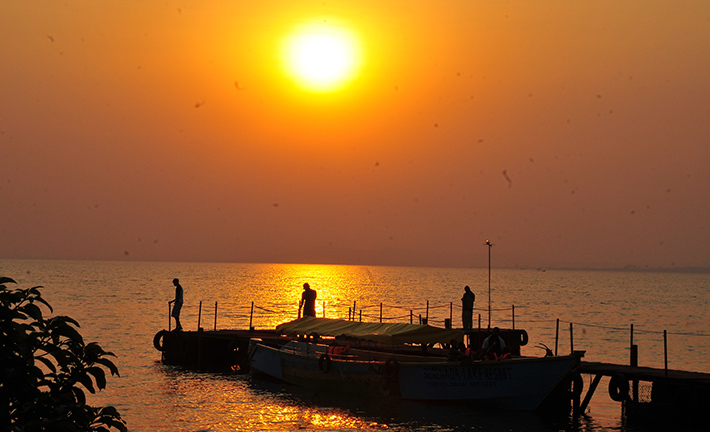 Lake Victoria sunset cruises normally start from water front pier and go all the way through to crossing the Equator line, visiting several fishing islands and also citing some water birds along the way. Drinks and snacks are providing hence giving you a nice evening experience on the lake. Lake Victoria which has the source of the longest River on planet earth is shared by the three traditional East African Countries of Kenya, Tanzania and Uganda. Some activities have been developed on Lake Victoria including boat cruies, sport fishing and several beaches along its shores. While in Uganda, you can participate in one of the above mentioned activities to make sure that you add a marine activity to enhance your experience. Lake Victoria was formed through warping. As tectonic forces affected East Africa, it is believed that as the west and eastern parts of East Africa were being uplifted through faulting, the central parts underwent down warping resulting into the formation of a basin. Rivers that were flowing west and Eastwards reversed and started powering into Lake Victoria basin hence forming a lake. As more water entered the lake, it had to find a point from where it could get out. It was at Jinja where the Nile begins its journey to the Mediterranean sea.